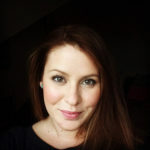 Last weekend was a very busy one for the blog, so much so I roped in my sister, Kirstie. 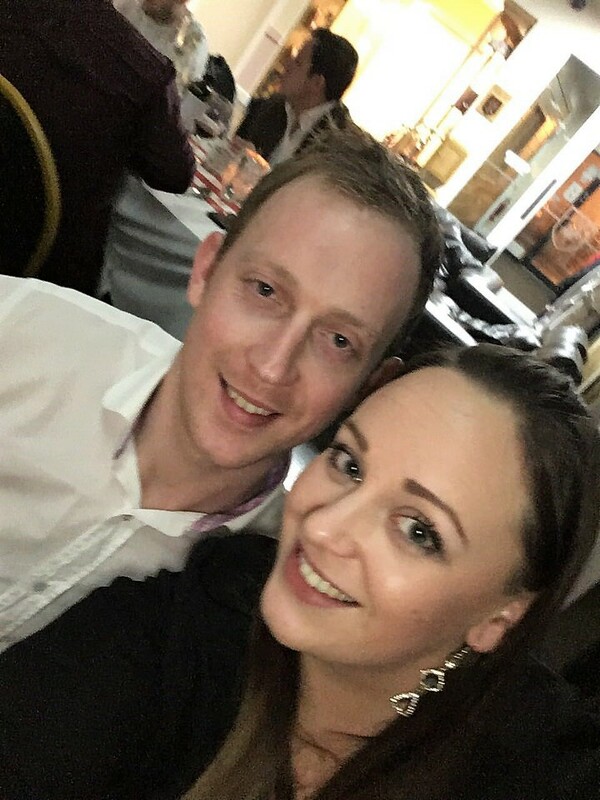 She and her lovely new boyfriend, John were invited to a pop up restaurant run by James who is re-launching his catering business Nomad Catering. Local lad, James has always had a passion for food and loves to make people happy when cooking. Armed with 10 years of experience and a Thomas Danby Catering College qualification under his belt the obvious step was to be his own boss. James has been providing outstanding catering for weddings, private events, corporate entertaining. 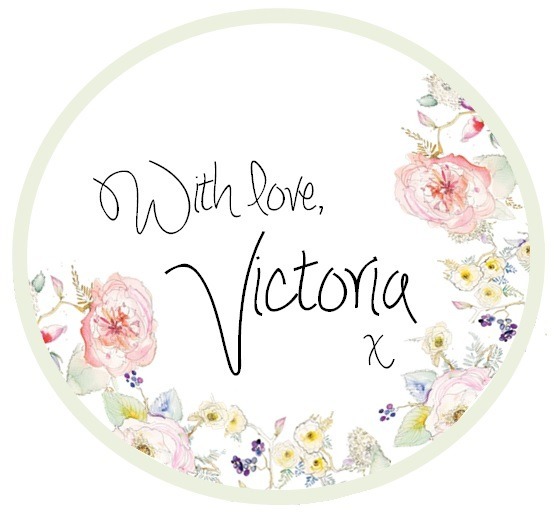 He believes in a bespoke service, with a personal touch, no two menus are ever the same. What I loved about James when I met his was his passion for food. He truly feels it’s an honour to be part of someone’s special day. Inspired by his travels, Nomad Catering try and push the boundaries of what is possible in catering on a large-scale. 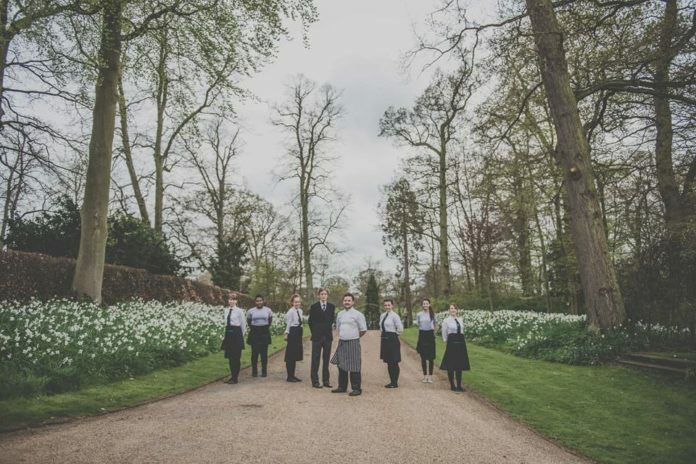 With James at the helm they like to bring new and exciting flavours from around the world as well as local seasonal food – he’s certainly not just another pop up restaurant! The night consisted of a five course tasting menu with pairing wines. 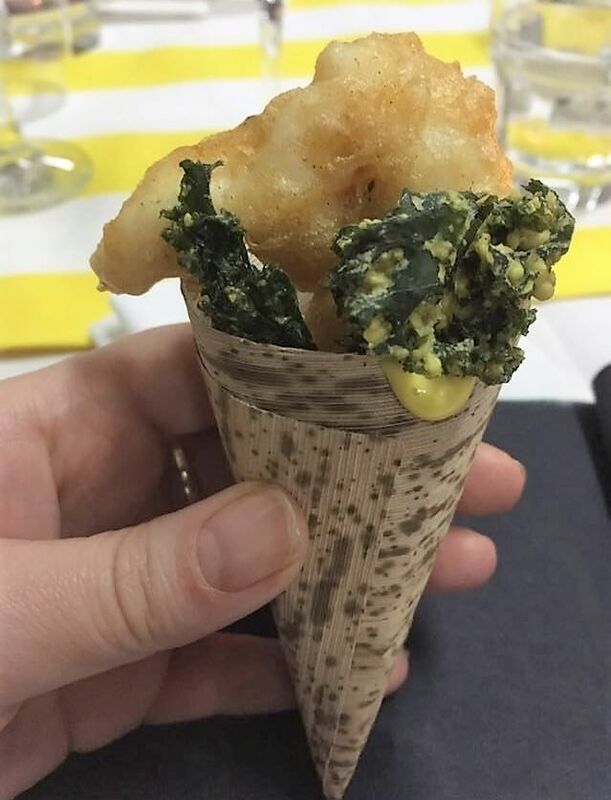 Kirstie and John were greeted with a glass of prosecco and a cone of Tandoori Haddock with Curried Kale Crisp and a dollop of Roasted Mango and Saffron Mayonnaise. It was a great starter to any meal and the flavours complimented each other. Seated on the same table as James’ wife Sara they were served the first of the five dishes. 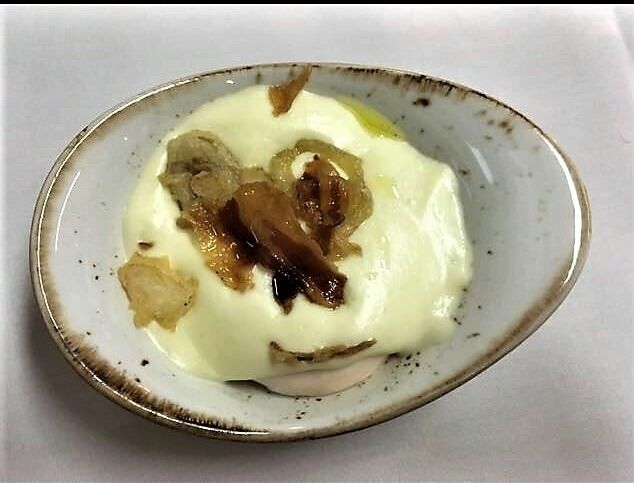 A Hen’s Egg with truffle potato, pancetta, and shallots. The taste wowed Kirstie; “An interesting melody of flavours. I’ve never tried truffle before so this was a new and exciting experience for me and John.” I was jealous of the second course as scallops are one of my favourite things. 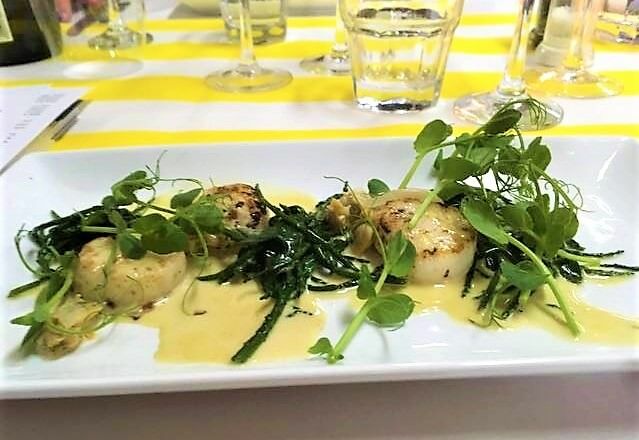 They were service Scallops which were cooked beautifully, served with Samphire and Sea Purslane, Cockle and Amontillado Sherry. John described this as; “a beautiful seafood emulsion. Certainly our joint favourite dish of the evening.” The atmosphere was great. Kirstie and John really enjoyed getting to know Sara. There was loads of time between courses to enjoy the chatter and let each course settle. Next up was the main. “Corr blimey it was good” said John. John loves his meat so this was right up his street. 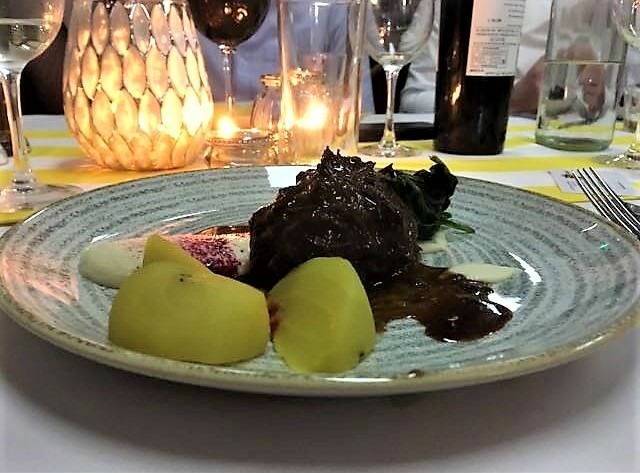 Dexter Beef Cheek, Celeriac, Beetroot, Baby Spinach and Marsala. Kirstie said; “It was incredibly succulent and cooked just how we like our beef. It all just melted in our mouths.” The best thing about eating out is when there is a Pre-Dessert. I mean who doesn’t like two desserts. I think we should adopt this and have it at every meal! 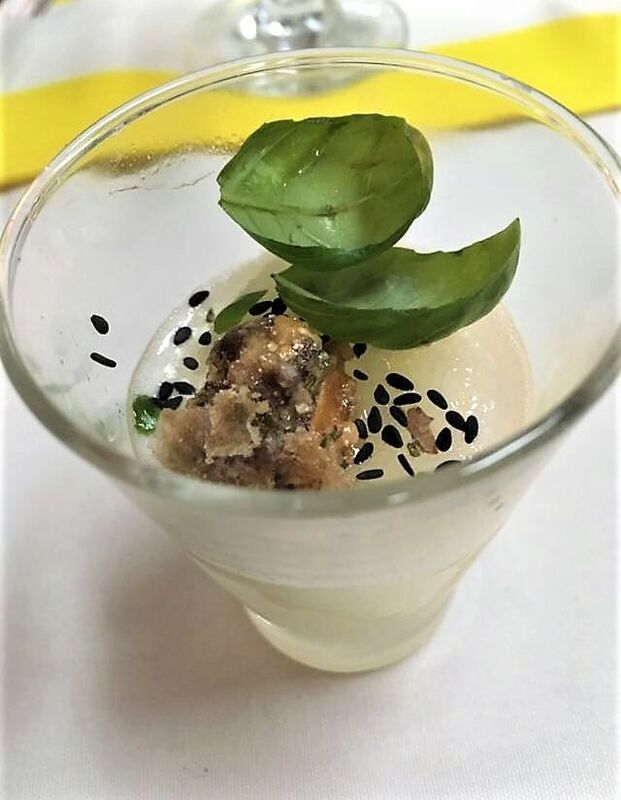 Kirstie and John tucked into a Limoncello, with a floating Walnut, Black Sesame and Micro Basil. The flavours we dramatic. “A really pow in your mouth. The perfect pallet cleanser” said Kirstie. 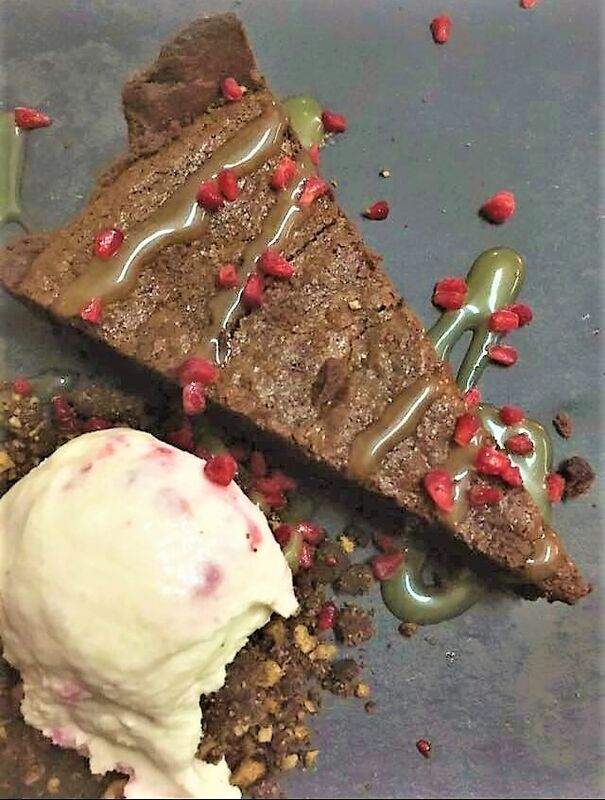 To finish they were served a Warm Dark Chocolate Tart, Salted Caramel, Hazelnut and Dark Chocolate Soil, served with a side of Raspberries and Maury Dessert Wine Ice Cream and Frozen Raspberry Cells. Both Kirstie and John felt the beautiful tart was perfect to top off a top night. For me blogging is about telling a story and getting to know the people I work with so I asked James a few questions to get under the chefs hat and know a little more about him. James’ favourite dish he’s ever created was one he served at his sister’s wedding. The Yorkshire Coast Fish Platter included a Whitby Crab and Dill Beignet with Lemon Mayonnaise, Beetroot Cured Mackerel with Horseradish Creme Fraiche, Orange and Fennel Gravad Lax, Potted Brown shrimps with Brandy and Parsley Butter, Steamed langoustines with Bloody Mary Marie Rose. Sounds heavenly! I always like to ask chef’s what they cook for themselves after a hard day in the Kitchen. James is a traditionalist and loves casual rustic food with big flavours. Slow cooked Moroccan Lamb Shoulder with Flatbreads and Fatoush Salad with Creamy Hummus would be his ideal food. My second questions was where would James eat out. Apparently it would have to be Fish & Chips every time, especially from Graveleys. James’ tip for any budding chef or for people lacking confidence in the kitchen is to “Have belief in your ability, it’s never as hard as you might think, and every catastrophe is merely a bump on the road to absolute perfection!” Good advice James. In James’ spare time he’s currently training for a triathlon, but often you catch him dancing in his front room with his two children, Charlie and Lucy. P.S Thank you to James for inviting my sister to his pop up restaurant. I hope he does one very soon so I can experience his delicious food. If you want to know more or are getting married this year contact James on 01423210016 or follow him on Twitter.